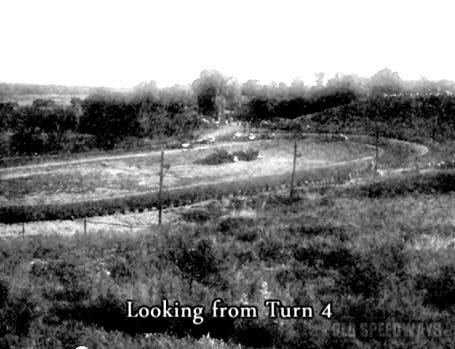 The familiar turn one view that most people know Coxsackie from. Below - Another view. 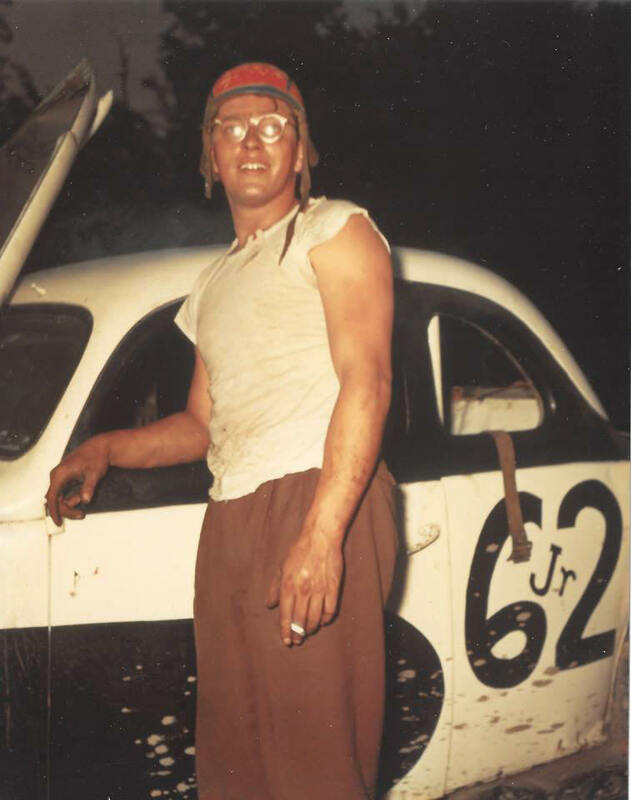 A rough and ready looking Carl Fink with the familiar 62Jr car. 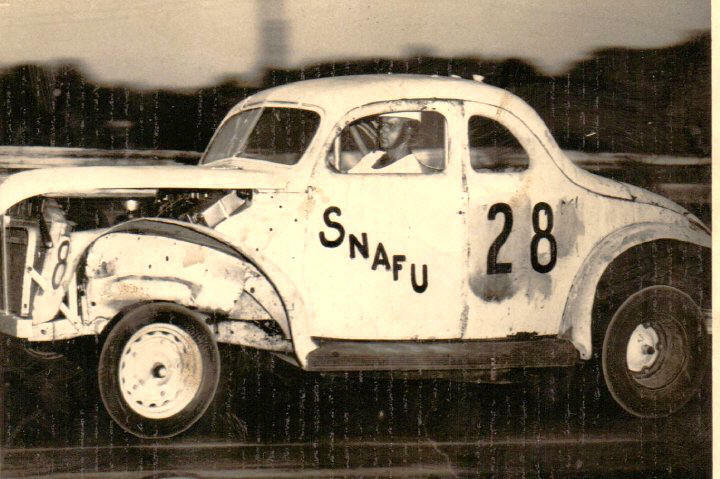 For those who don't know - SNAFU was an acronym made up during WWII.You can pretty much figure what the FU stood for. 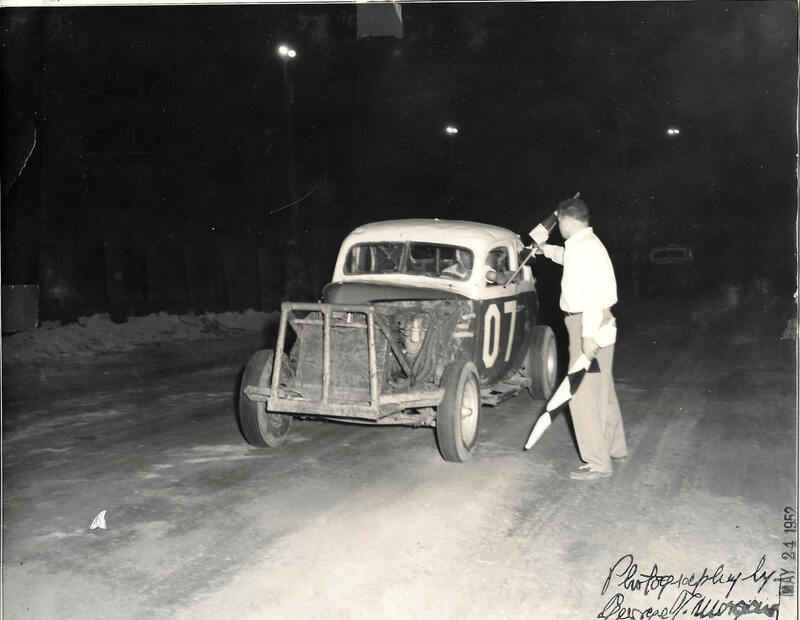 We need help with driver name for this car. 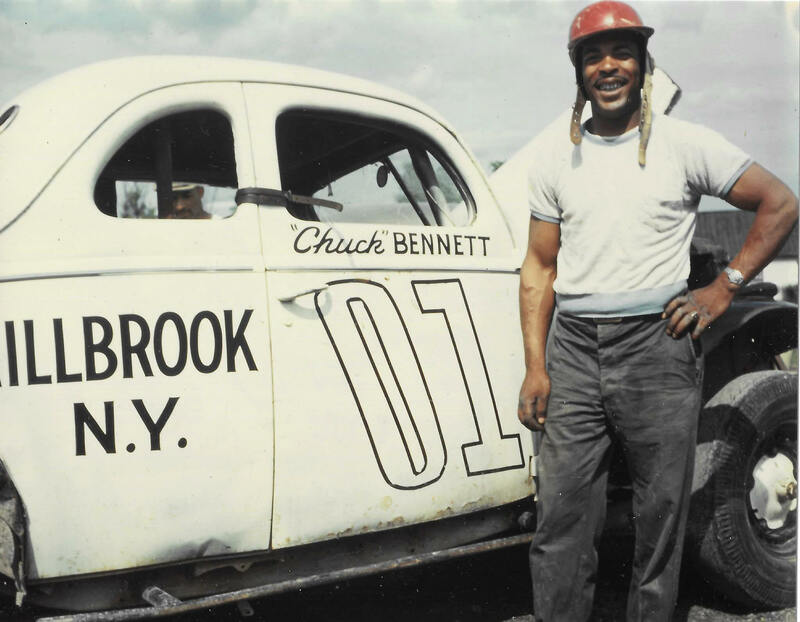 Chuck Bennett, Northeastern African American racing pioneer. 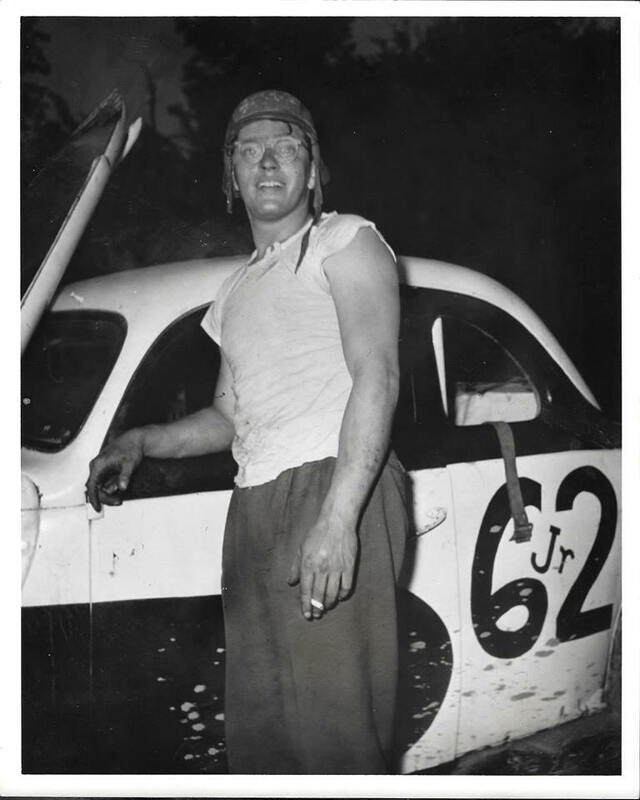 He joins the likes of Johnny Kettel, Bo Green, and Bennie Myers. 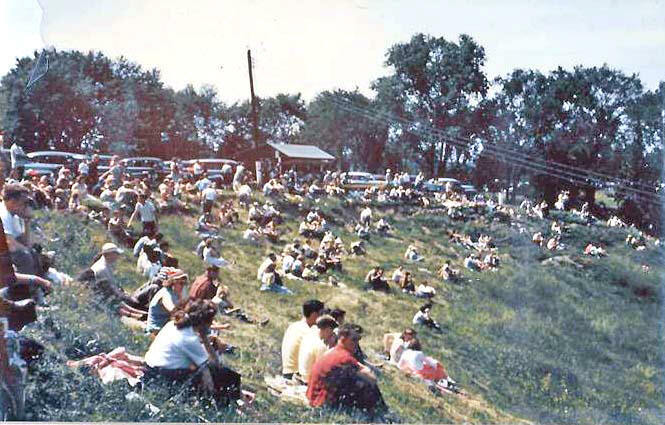 Postcard shot of a car crashing in full view of the folks on the familiar t urn 1 banking at Coxsackie. 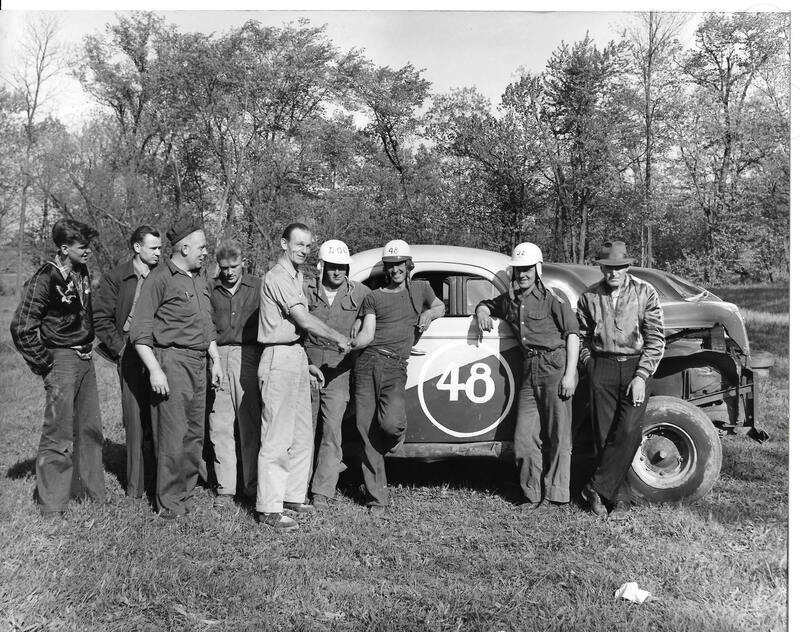 Opening day, 1952 winner Fred Searing. Maybe we now know why his son was named Lou. Good people. 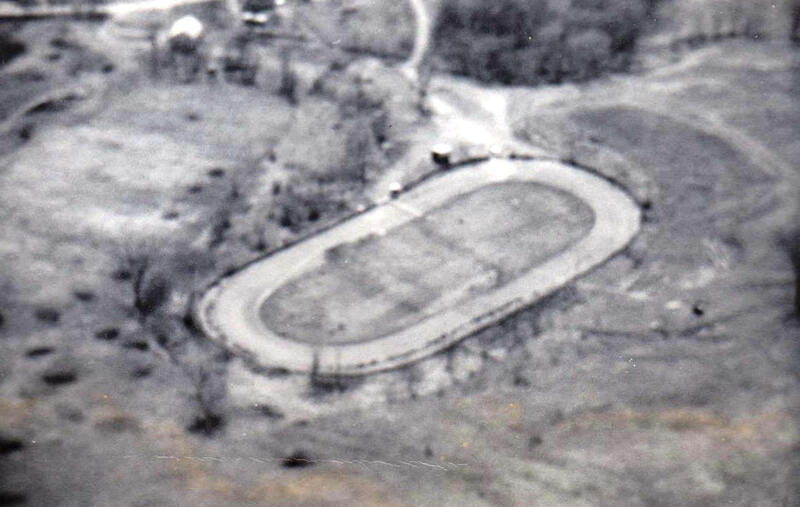 An aerial while the track is apparently still in operation. 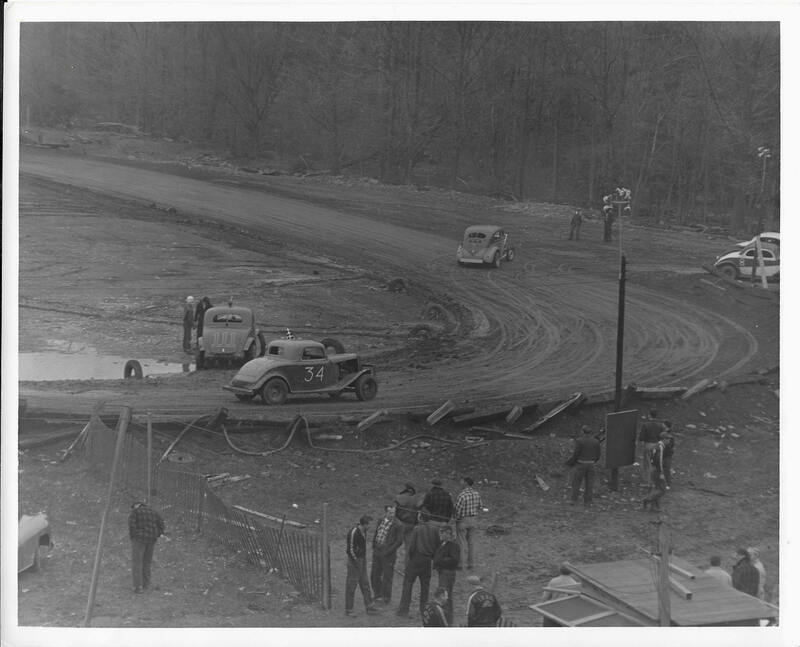 April, 1953 shot of wet conditions after what appears to have been a heat race. 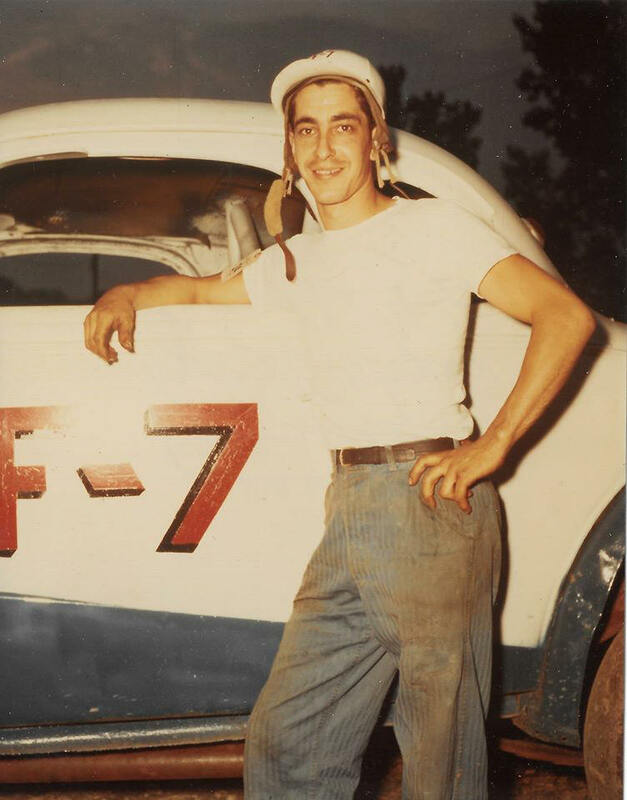 Car 7 or possibly F7. 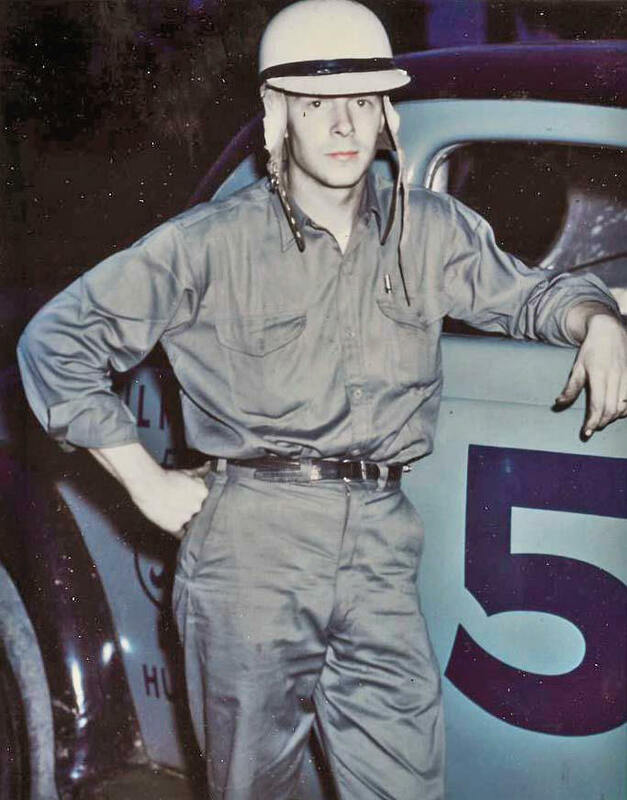 We need help with driver name for this car. Car 11. 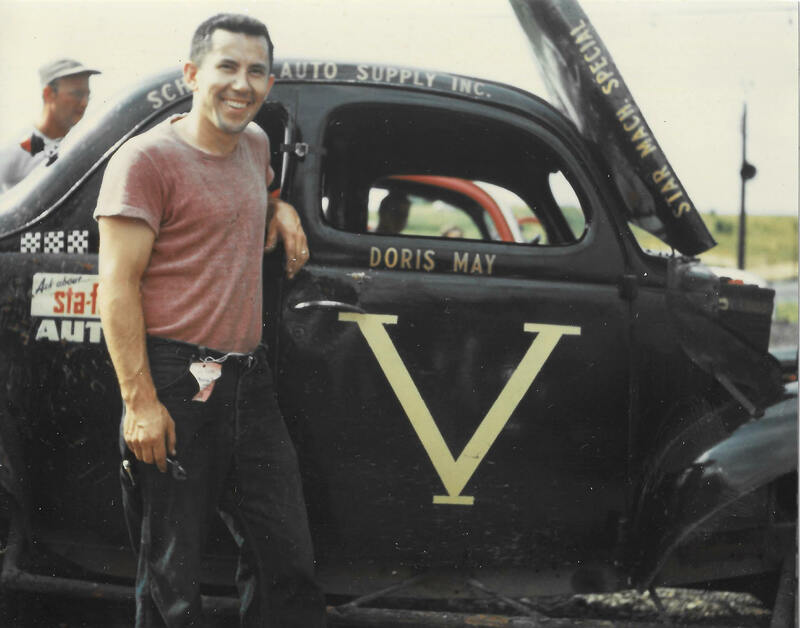 We need help with driver name for this car. Driver gloves even !. 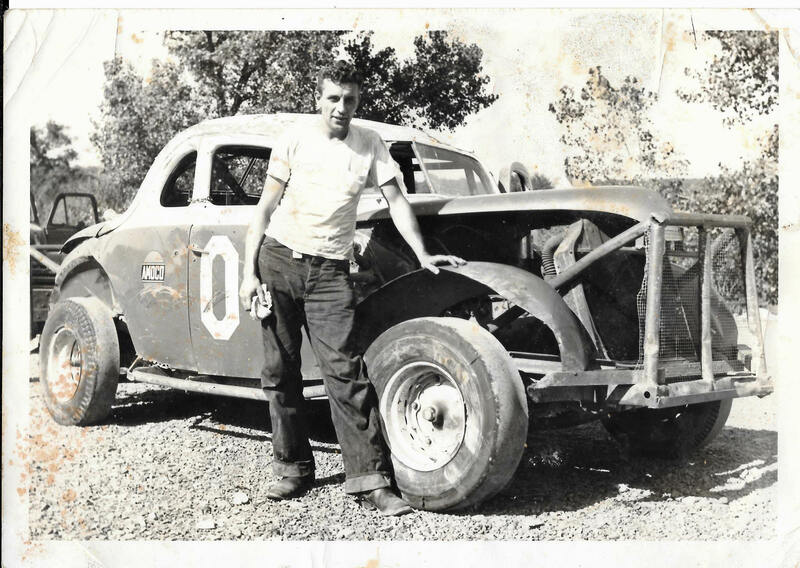 We need help with driver name for this car. Car 23. This guy has more photos of him than anyone else except maybe Spaulding or Garrison. 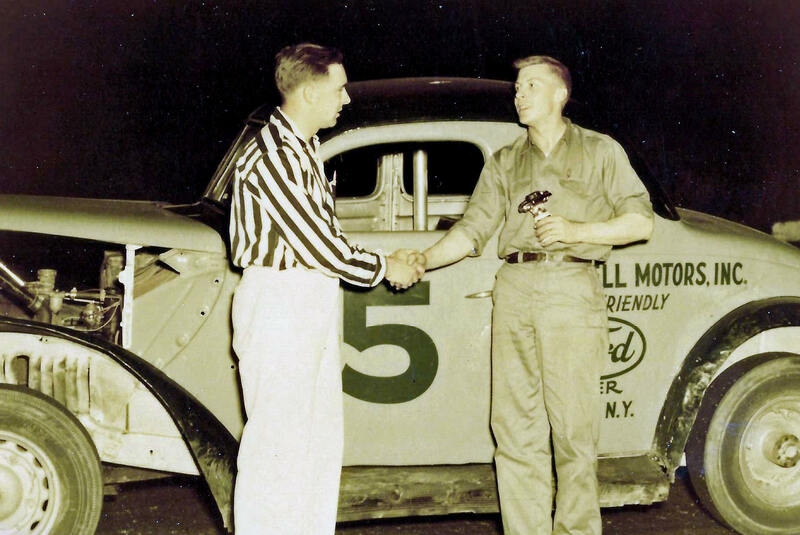 We need help with driver name for this car. 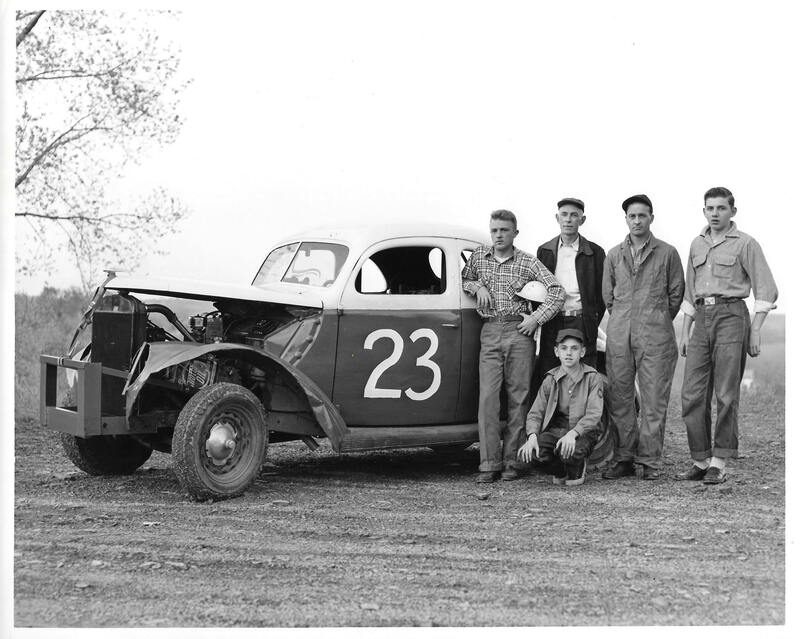 Car 23, with the whole damn gang. 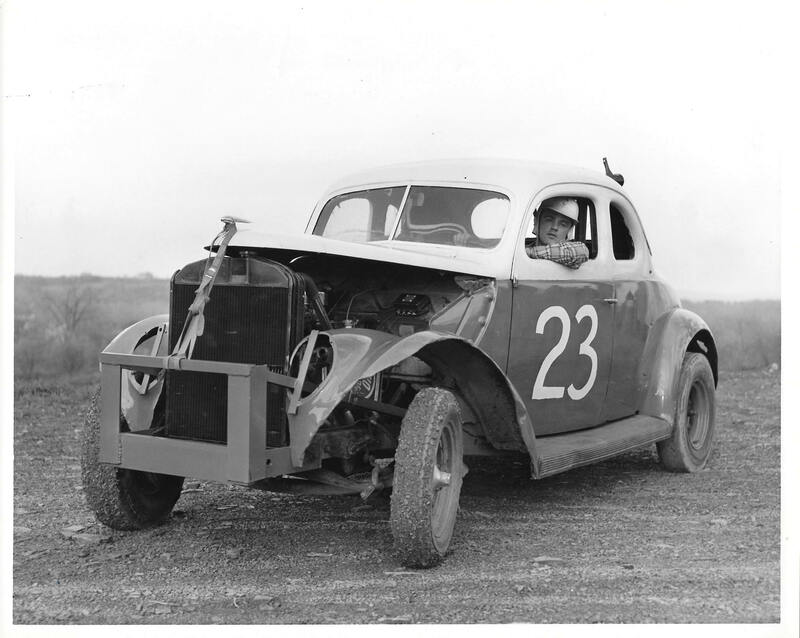 We need help with driver name for this car. 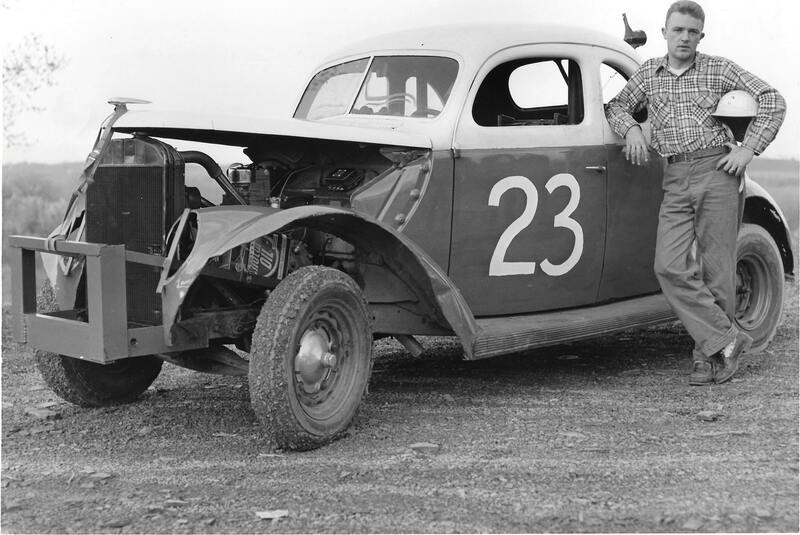 Car 23 again. 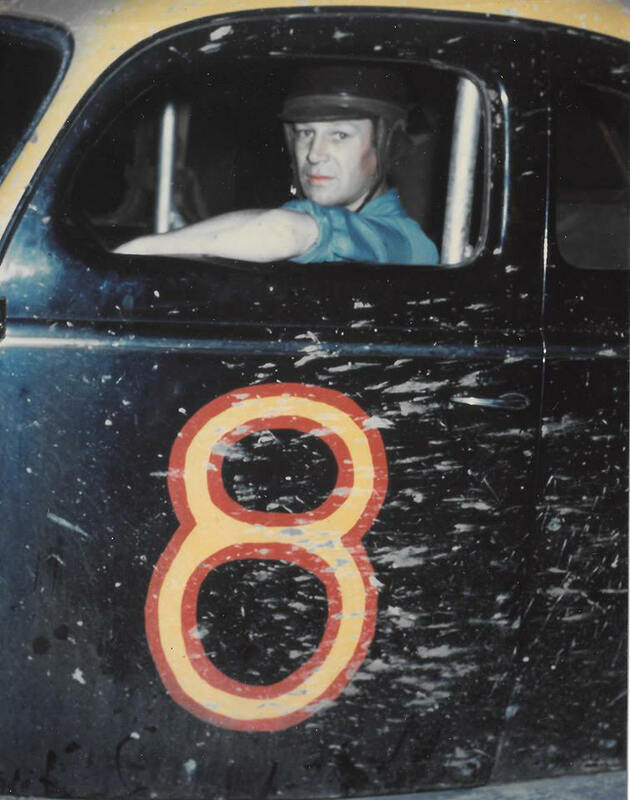 We need help with driver name for this car. 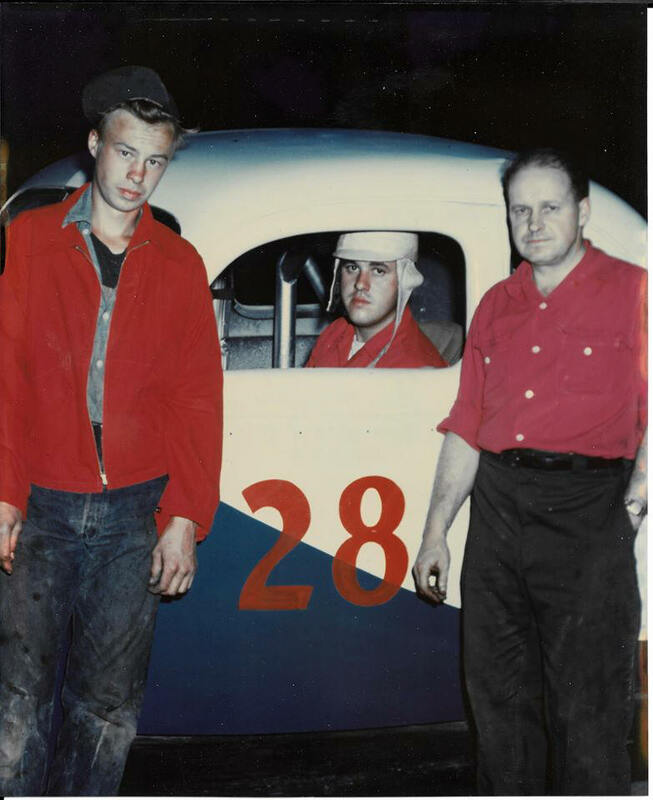 Car 28 Bill Redner and crew. Any relation to Hoppy Redner? 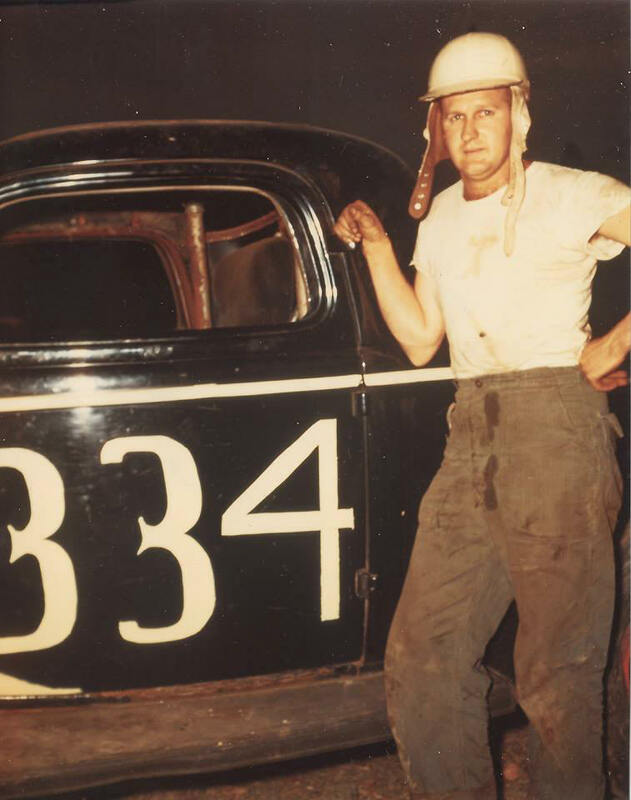 Car 38. At a distance, this car looks like a #38 Stretch Van Steenberg drove, but I am not convinced that is Stretch in the car. Looks like him. 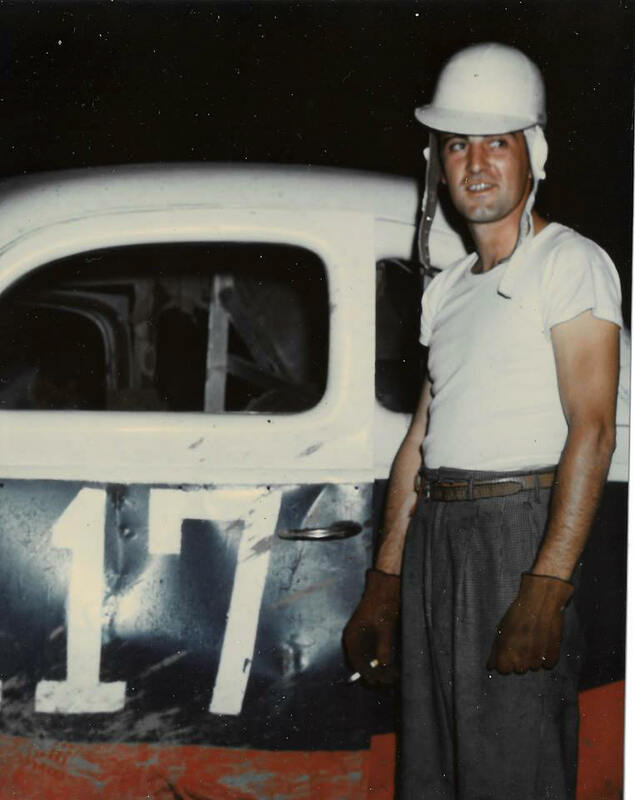 We need help with driver name for this car. Car 38. Not Stretch. Below - The SVS 38 at L. Valley. Same car - that's pretty obvious. Car 334. 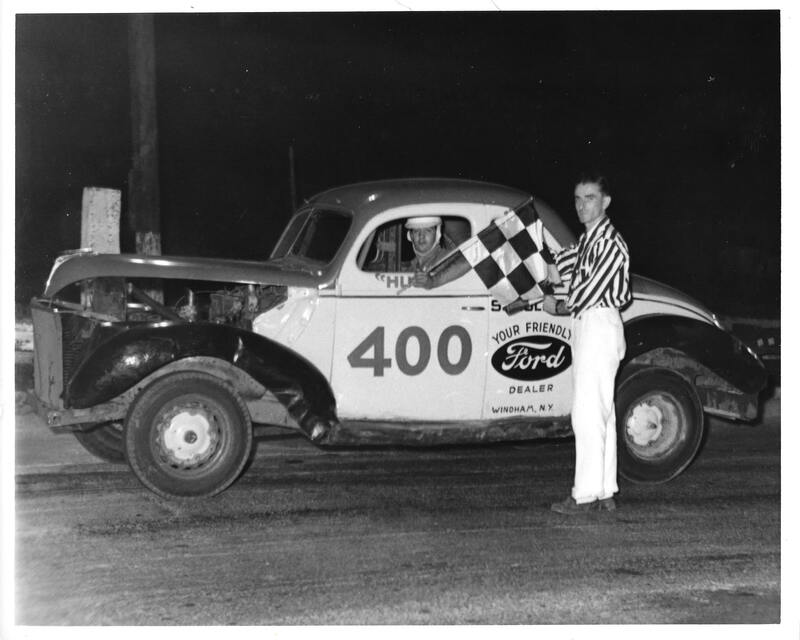 We need help with driver name for this car. 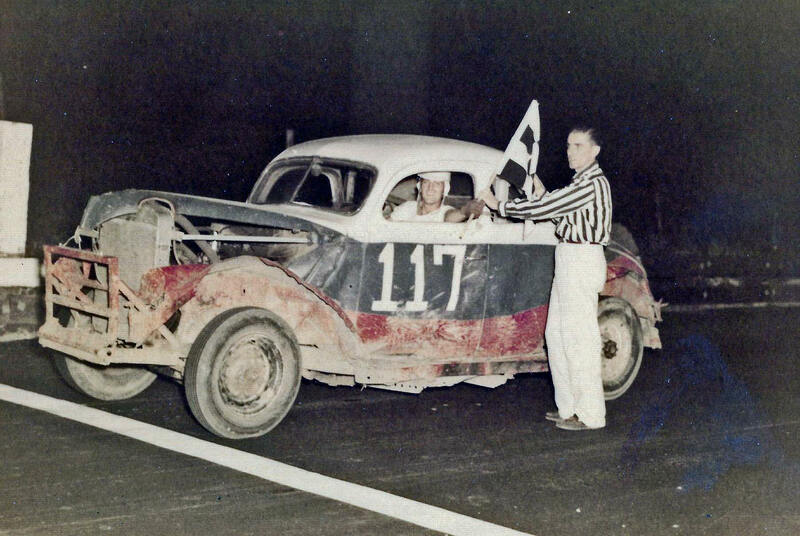 Car 117 getting win. This is not the Garrison 117. 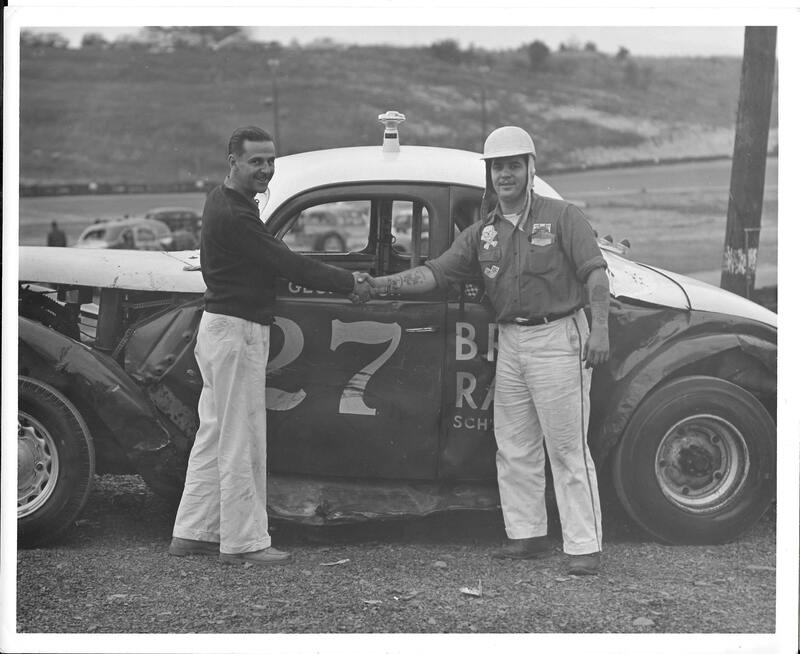 We need help with driver name for this car. 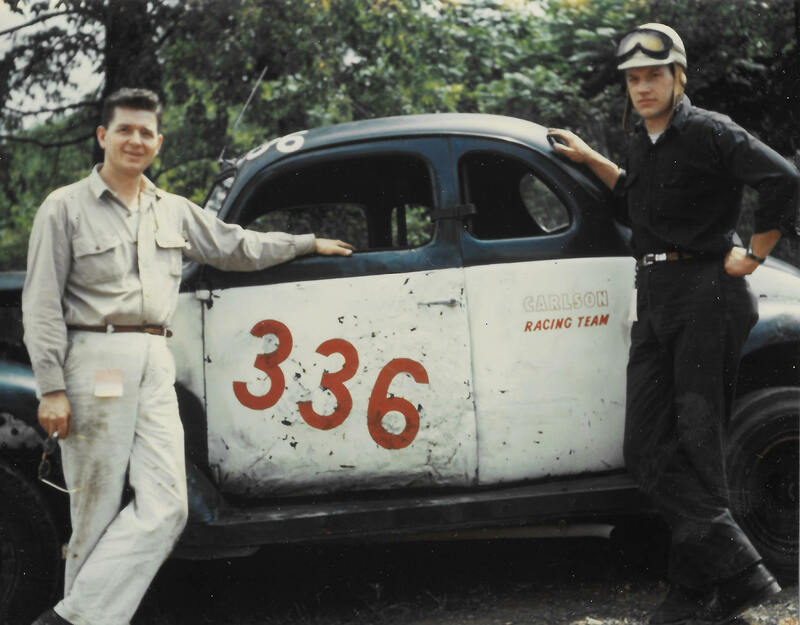 Car 336. Someone named Carlson apparently involved here. 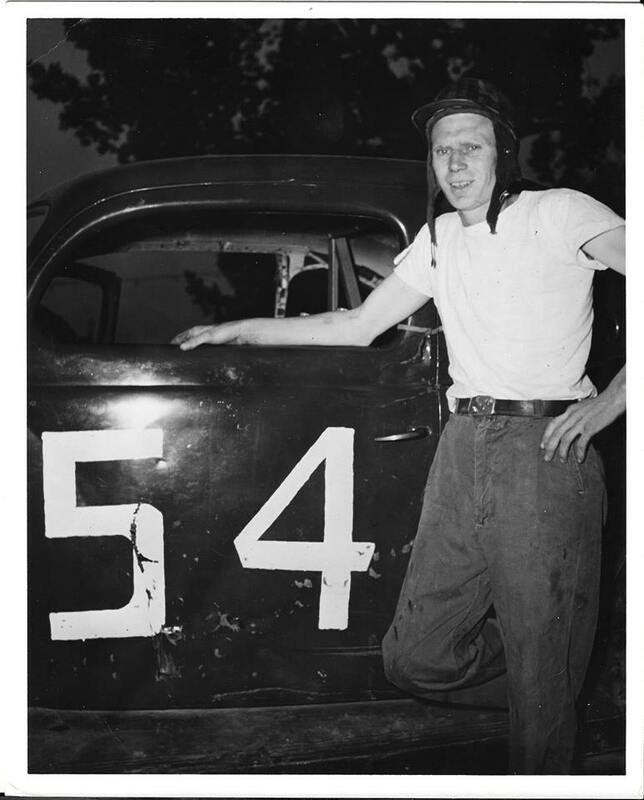 We need help with driver name for this car. Car F-7. Confident looking guy. 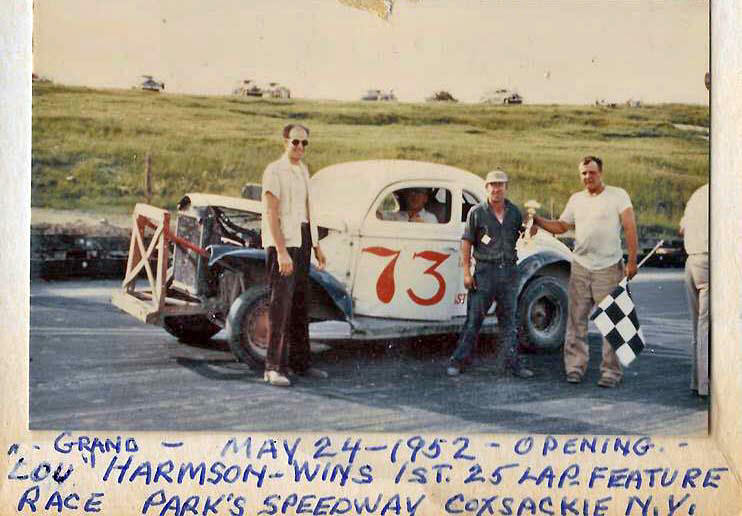 We need help with driver name for this car. 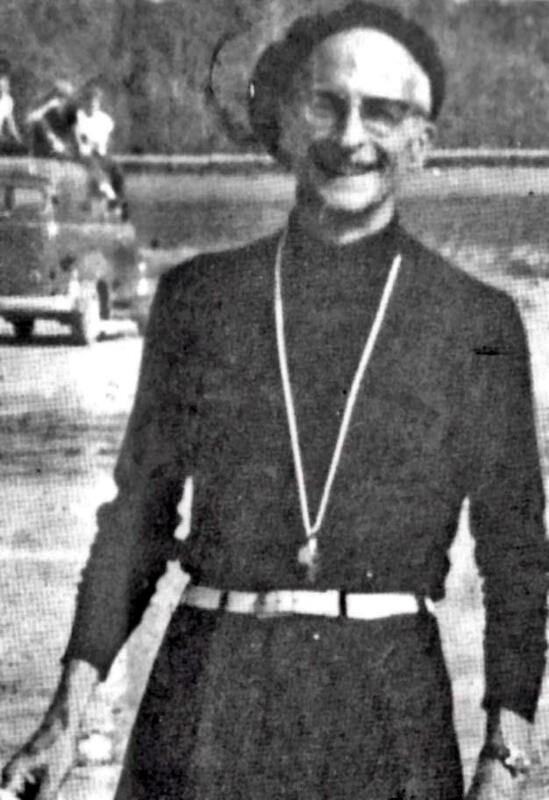 Carl Fink. Same shot except in black and white. 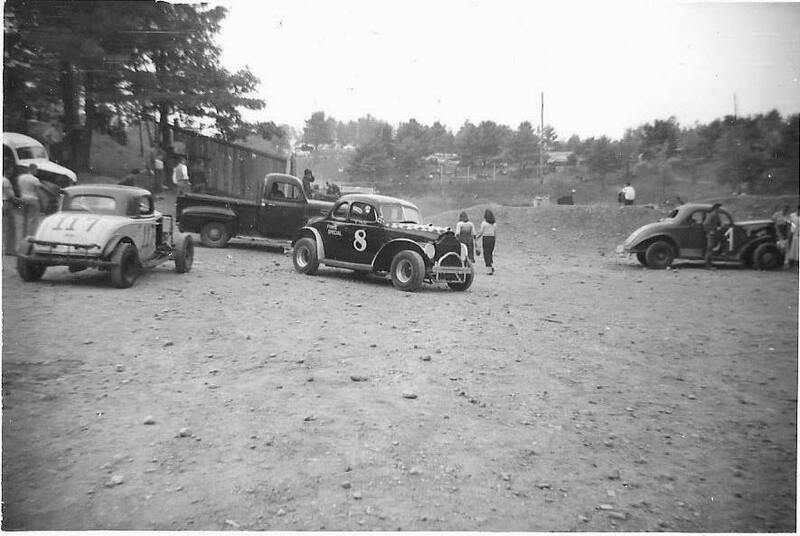 Cars in the pits. Definitely newer version of the 117. 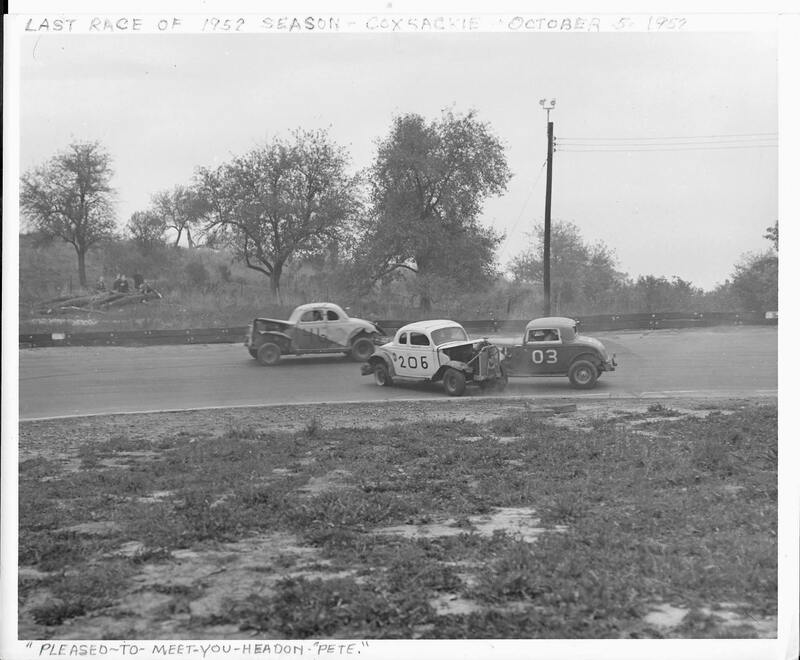 We need help with drivers name for these cars. 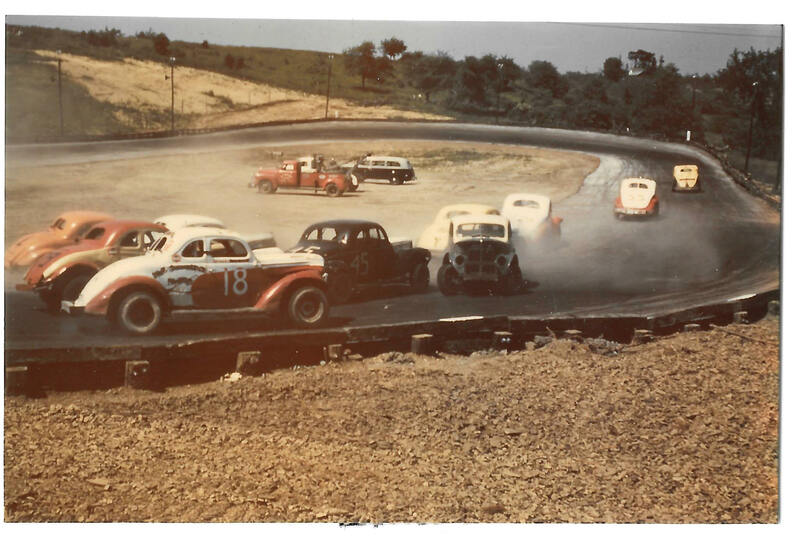 Great shot of a skirmish. 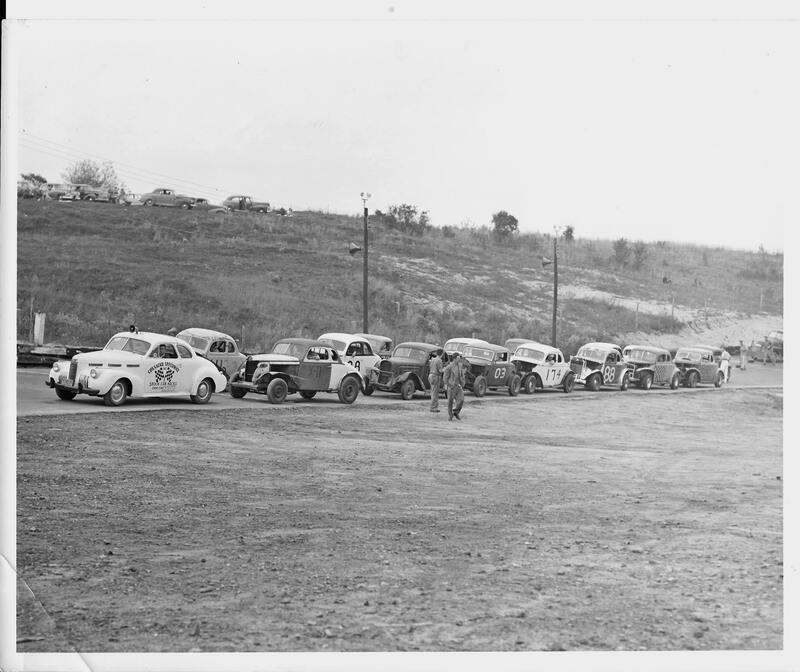 We need help with drivers names for these cars. 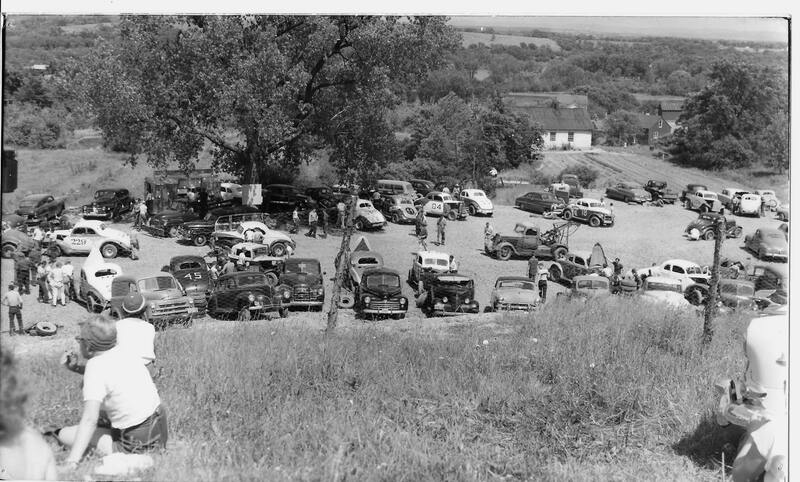 Car 48 and lots of company. Don't know what's going on but it is a great shot. We need help with these names. I love this shot - might be the best one. I am surprised to see bleachers. 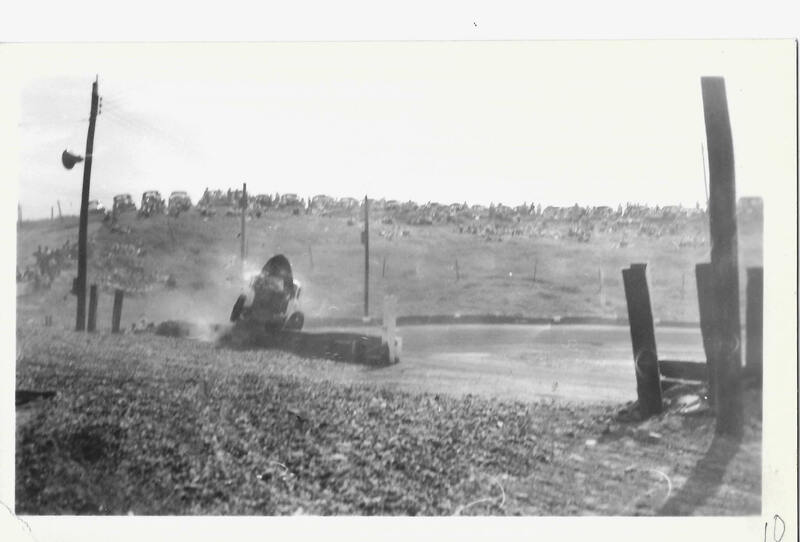 Don't you love the "safer barriers ? Cement. 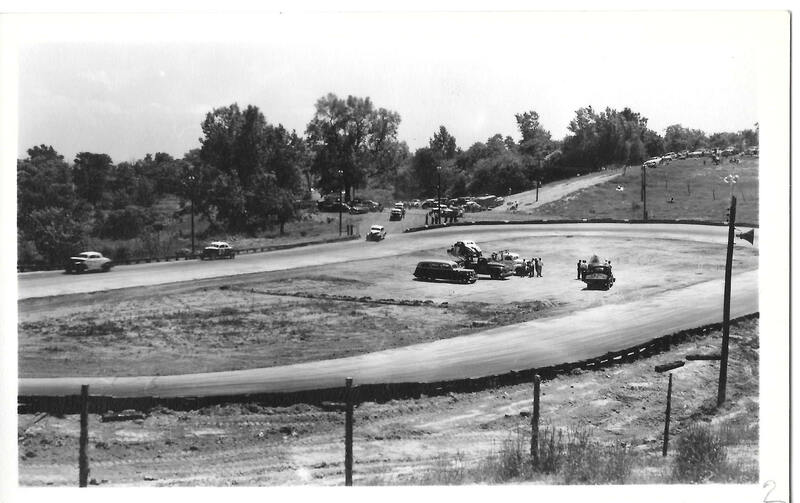 We need help with drivers names for these cars. 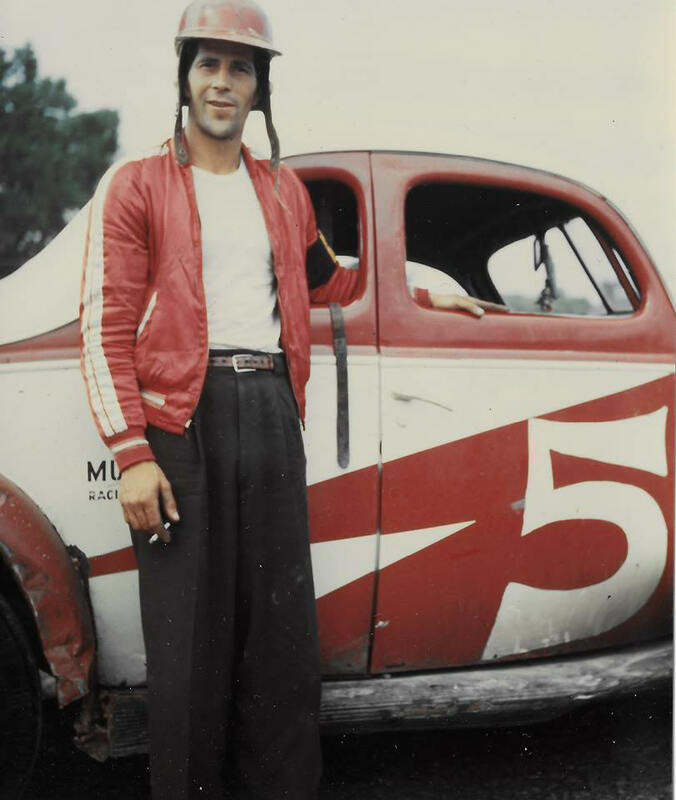 Huck Spaulding, from Catskill. 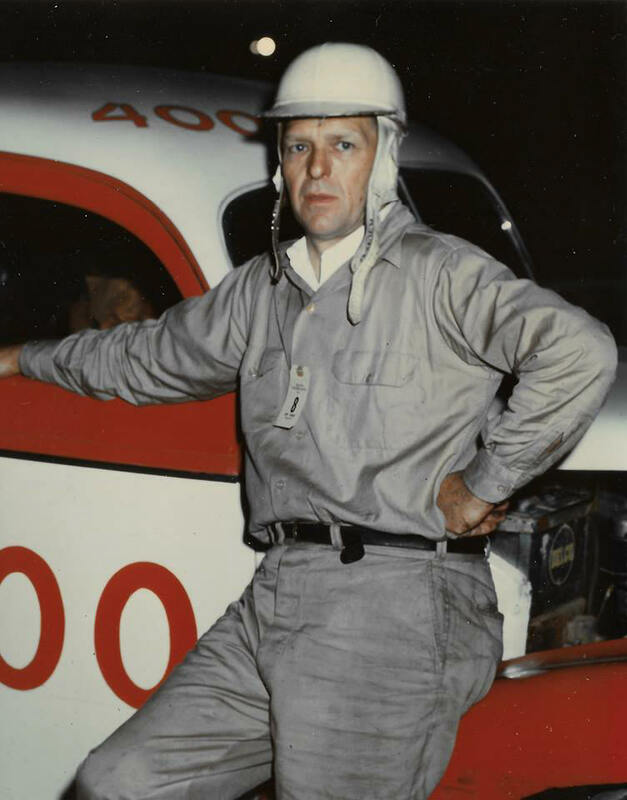 He drove ice racing cars until he was about 150. Huck Spaulding again. Very professional - looking car. Huck Spaulding again. 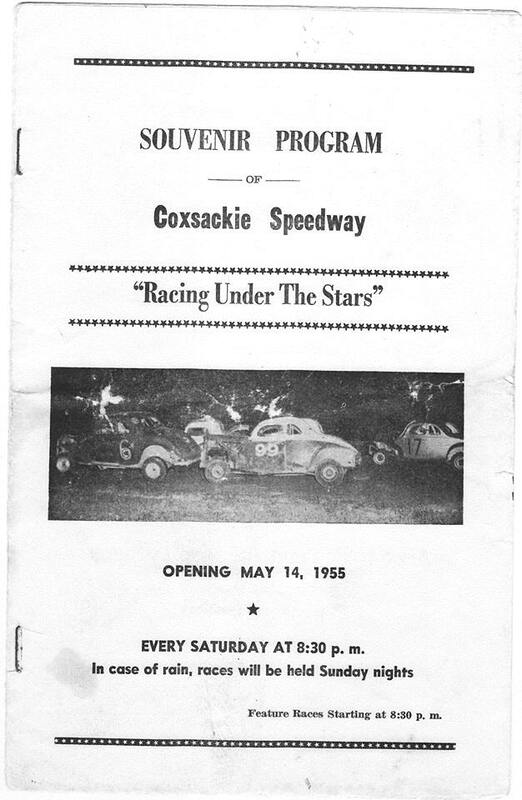 Driving Jim Brush's 27 at Coxsackie. 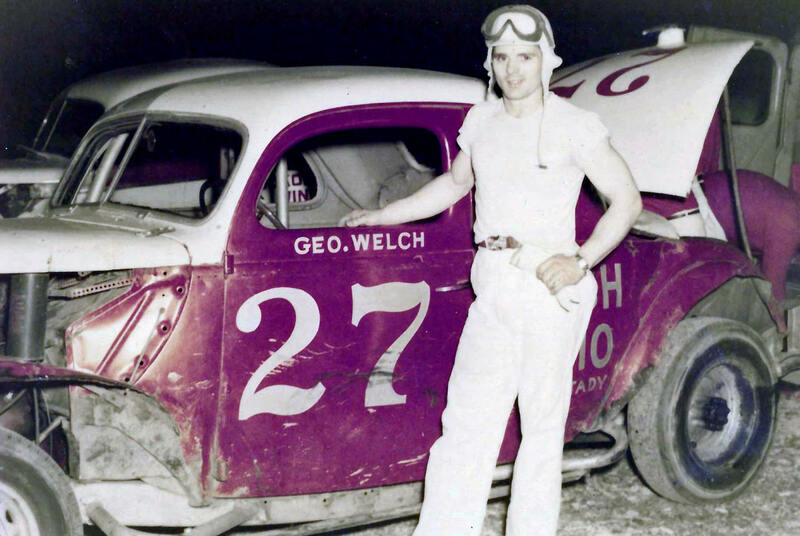 Sometimes George Welch drove it. 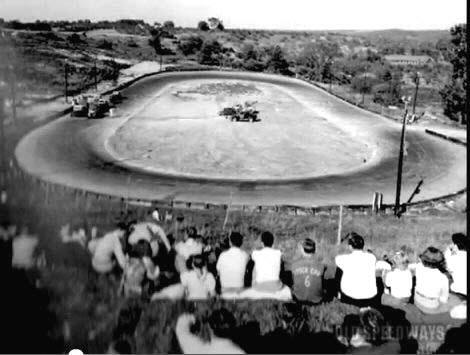 Great view of the pits..
Joe's program. I have one, too, if I can find it. Great action show with a smoking Car 5 on the pole. 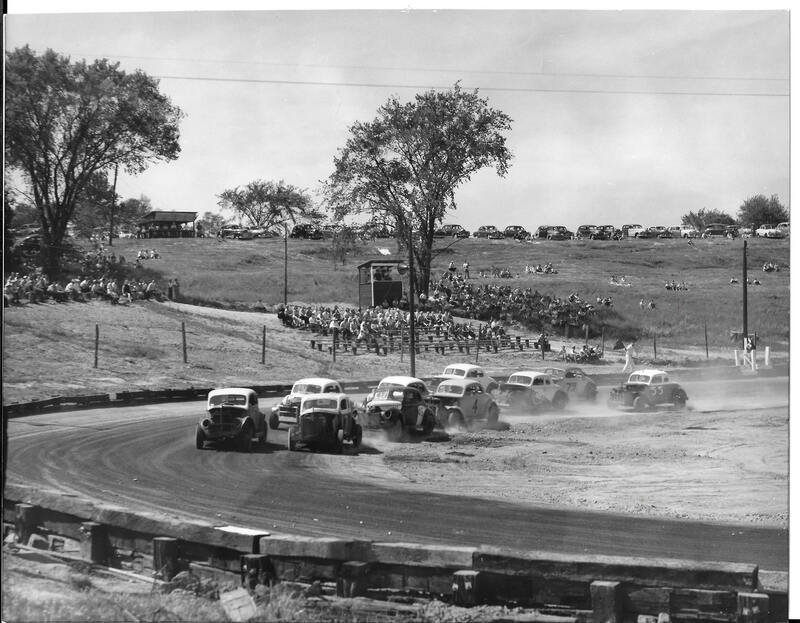 More action, with Fred Searing leading the pack. We need help with driver names. The 01 with a spare wheel at the ready. 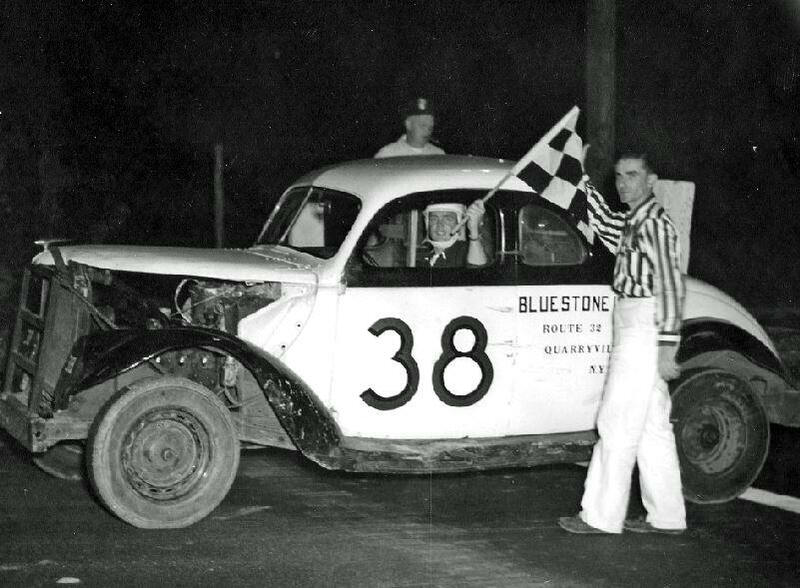 We need help with driver name for this car. 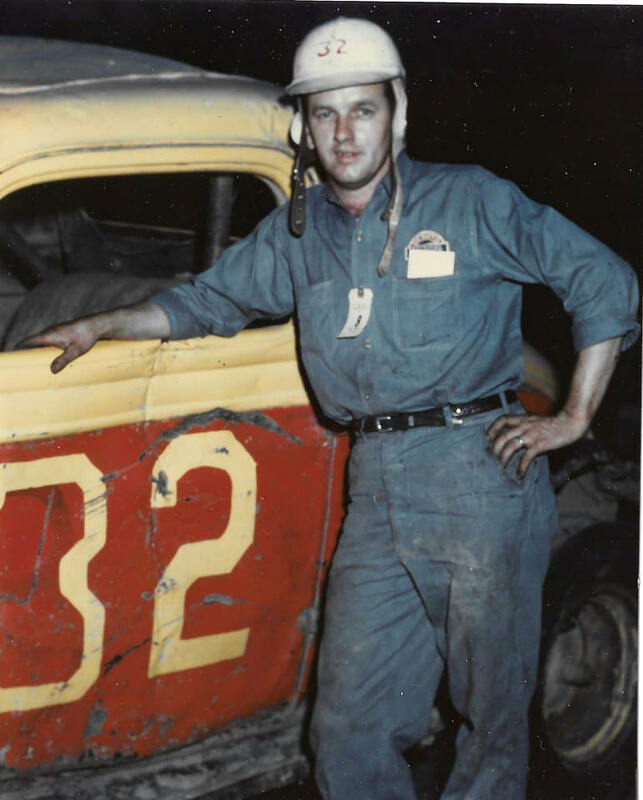 Howie Westervelt of Ravena, NY. Looks like him and the car number is accurate for the time. 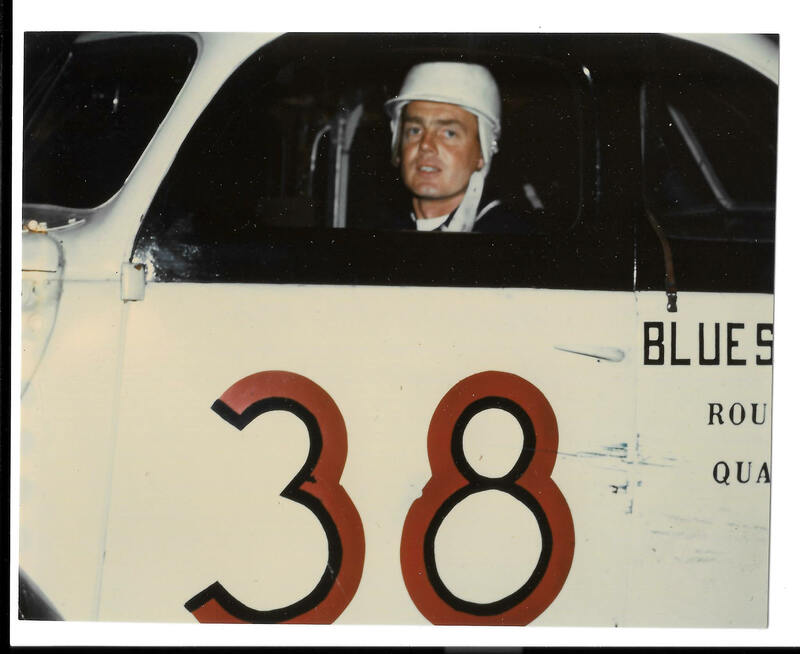 The smokey Car 5 from a previous action photo and the snappy - dressed pilot. 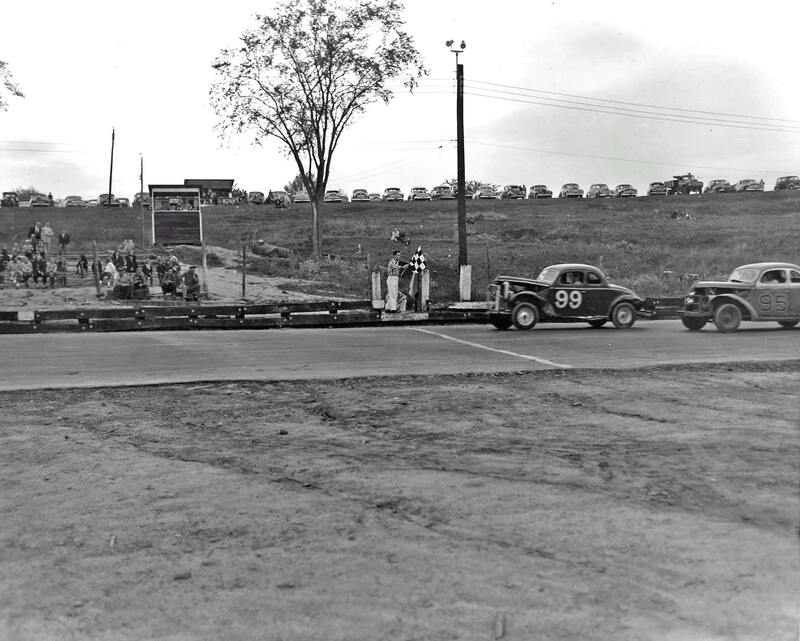 Duke Southern, apparently a NJ driver. Professional - looking entry. 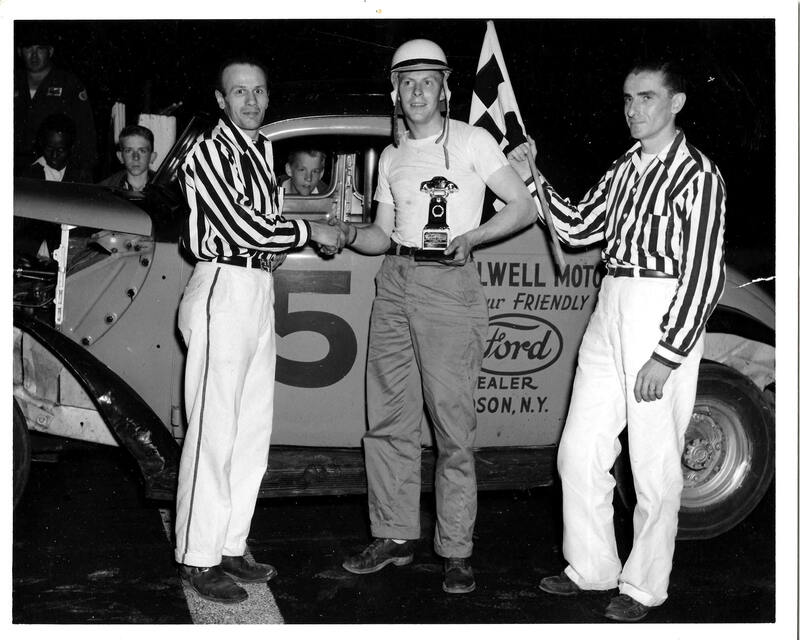 Doug Garrison winning May race at Coxsackie in 1953. 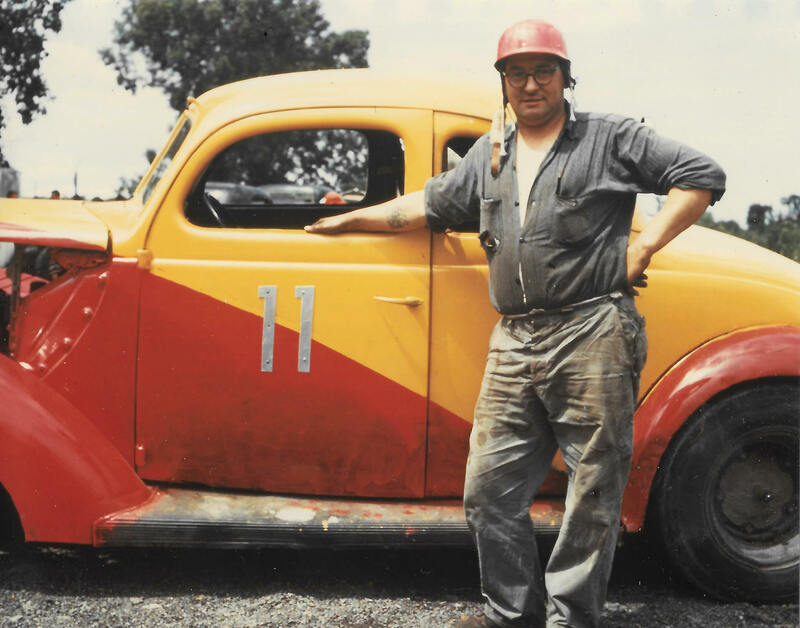 Doug with his Coxsackie car. Apparently very good equipment. 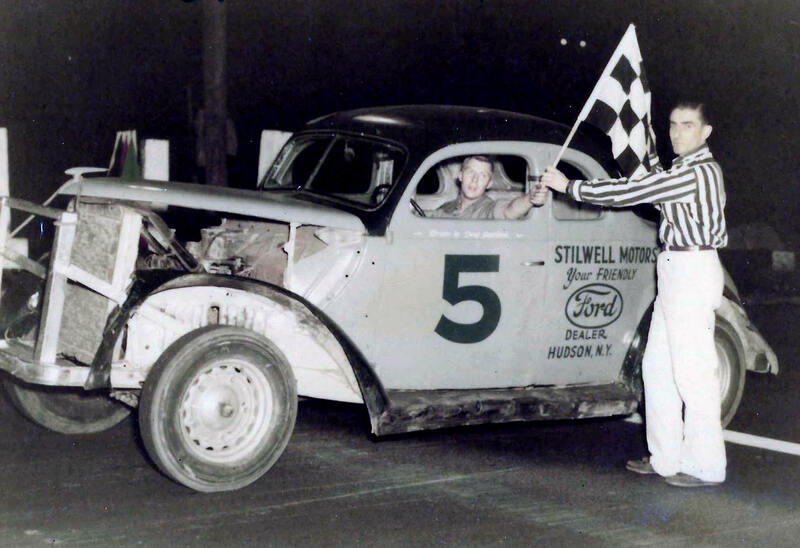 Another Stillwell Motors 5 victory. It's too bad better records were not kept in this ewra. 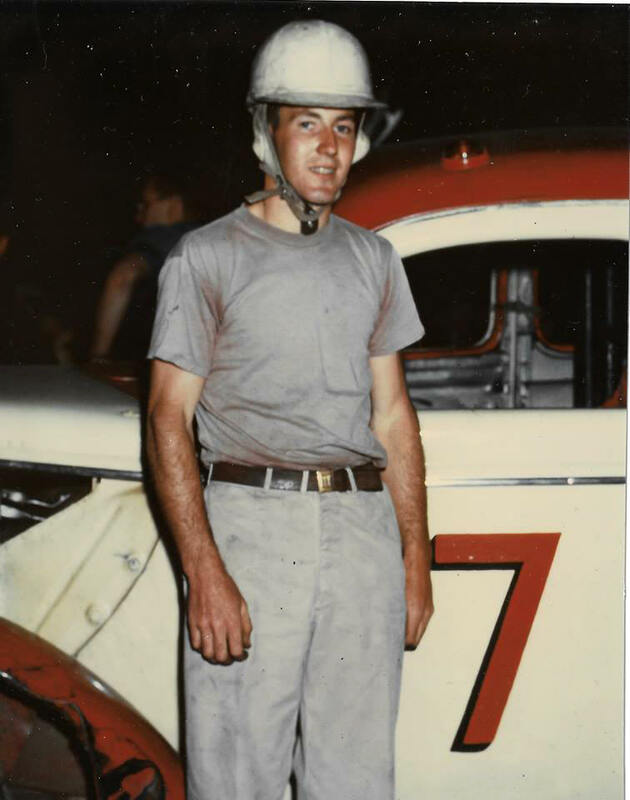 Drivers like Garrison, Westervelt, and others likely set records we think people like Hearn are the first to set. Doug winning a Coxsacie race with Barney Tompkins' 99. 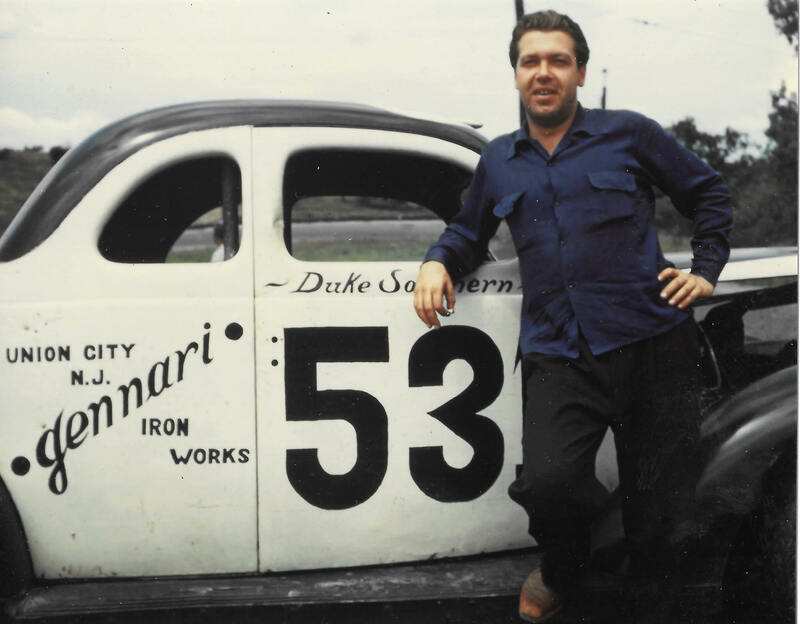 We need help with driver name for the 95 car. 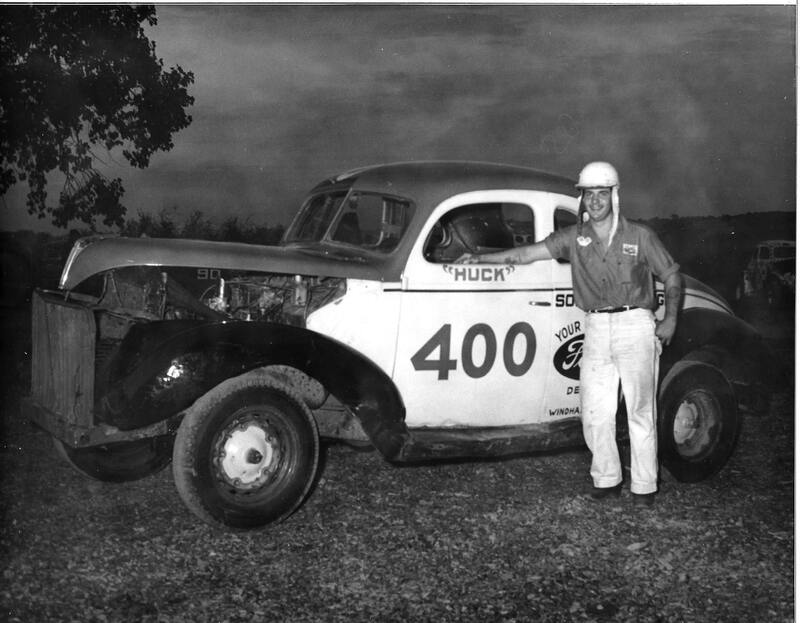 Hal McCarty was a top driver of that era - at several tracks. A different car for Hal here. 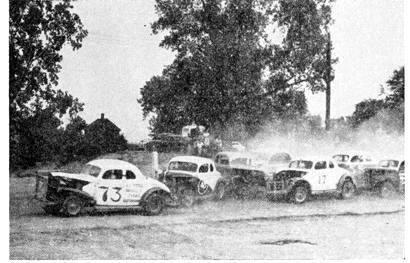 George Welch driving Jim Brush's 27 at Coxsackie. Sometimes Huck Spaulding drove it. 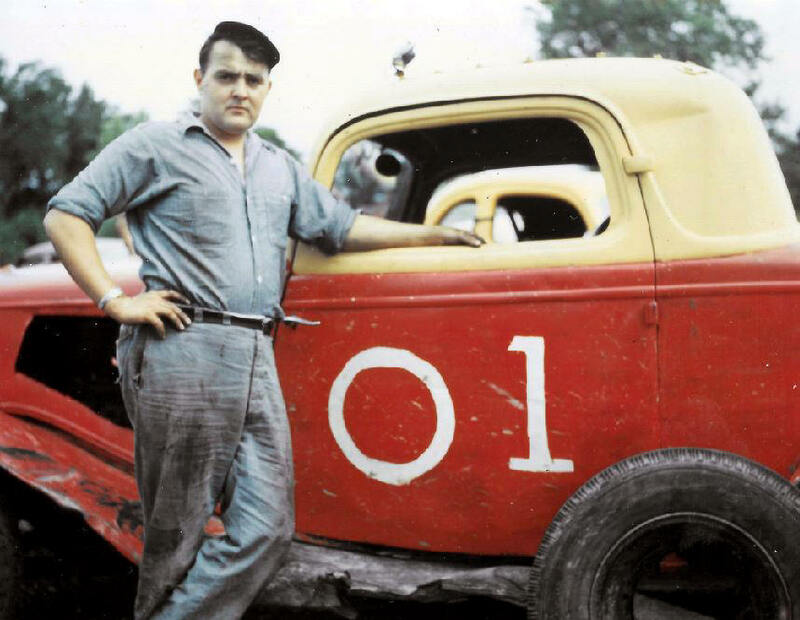 Link Pettit, with his father-in-law Martin Lawrence's 00. We saw this car in Vermont in this time period. 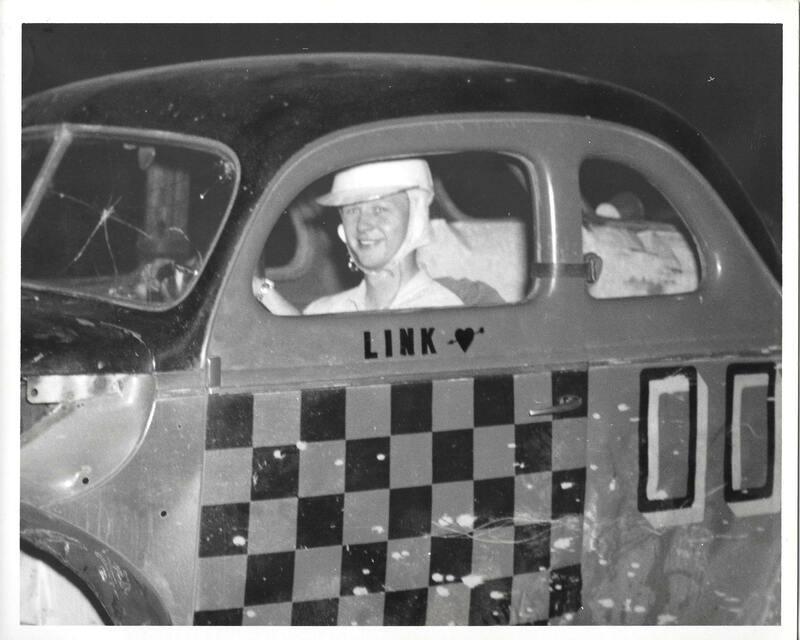 A night race win for Pete Winnie, who also appeared at tracks like Rte 66 Spdwy. Pete Winnie with something approaching race tries. Another Stan the Man win. Check out the little girl so close to the track. 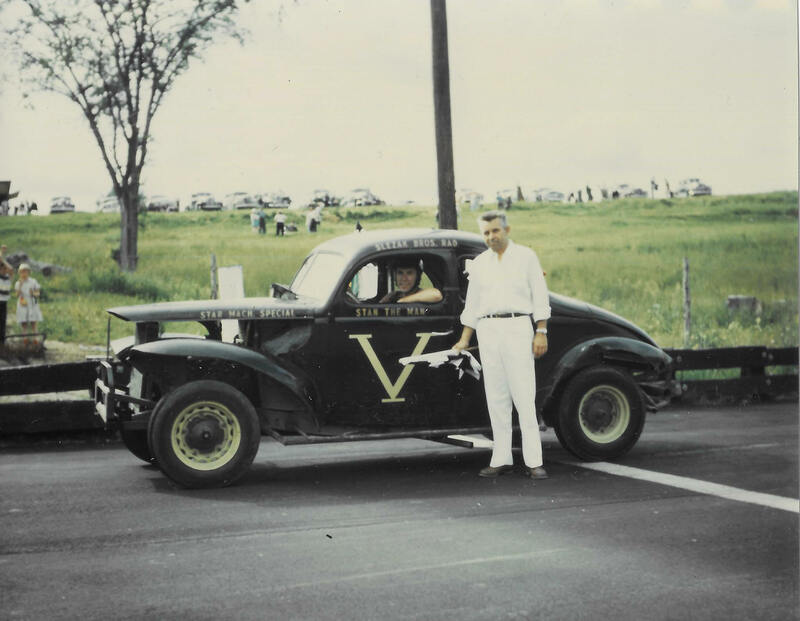 Art Stuarts, Jr. - father of the Valley's Uncle Art, was chief pit steward at Coxsackie for a time. 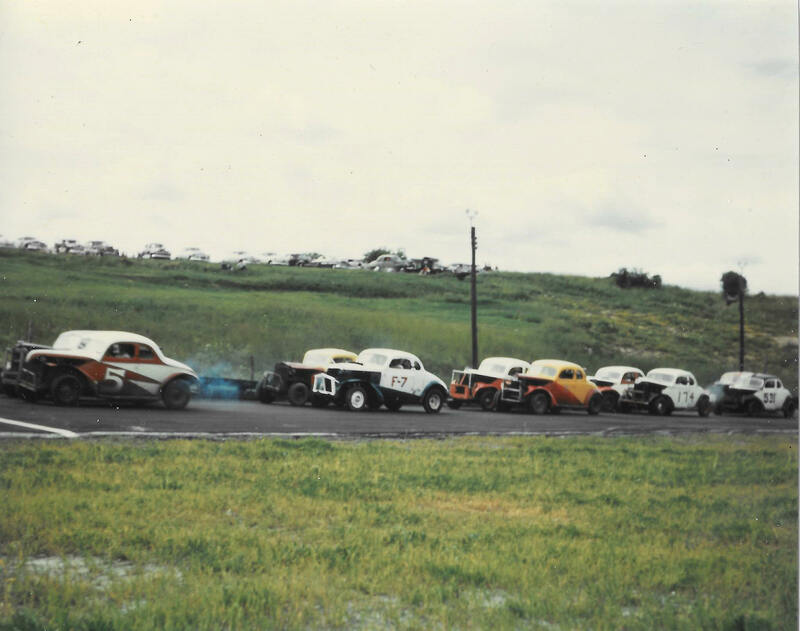 A 1952 race lining up. Don't you love the pace car ? I sure do.